Footpaths have been reopened but many walkers still face barriers and obstruction. The Politics Show reports. 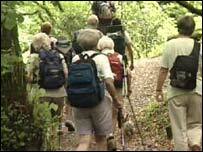 Hikers and ramblers contribute £6m a year to the South West economy. If nothing else the closure of the southwest's footpaths during the foot-and-mouth crisis underlined how valuable they are to the rural economy. 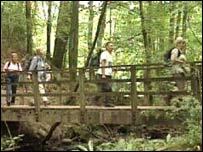 It is estimated hikers and ramblers contribute £6m a year to the South West economy. Nationally more than 500m walking trips are made annually in England alone and the Ramblers Association claims that walking supports 200,000 people in jobs. But at the same time the Audit Commission estimates nearly a third of Britain's footpaths are difficult or impossible to use owing to obstructions of one kind or another. And nowhere is that more true than in Cornwall. The county council has some 6,500 rights of way to maintain, a network of approximately 3,500 miles. The Ramblers Association estimates there are upwards of 6000 obstructions of one kind or another on the footpath network. "This is the culmination of many decades of neglect in which Cornwall County Council has under funded their work to protect public rights of way." The obstructions are both man-made, from fences being built across rights of way or due to the failure to resist the forces of nature. Penwith's Right of Way officer Graham Ronan cited as an example a footpath near Ludgvan where the granite stile had been overgrown with gorse, brambles, briars and blackthorn to the point where it was impassable. "What worries me," he said, "if we don't get these footpaths sorted out by the first of January, 2006, which is the date set by the Countryside and Highways Act, 2000, which is when we get the final version of the definitive map, then they will be lost forever." Cornwall County Council admit there is a backlog. But a spokesman said it had set up a partnership with parish councils to take on the maintenance work which was proving successful. 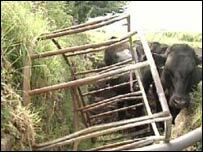 But hopes of additional government assistance had not yet materialised. "The environment is the council's best asset and we want to keep it that way and are committed to addressing the backlog. "As the new portfolio holder I shall be doing my very best for Cornwall's Rights of Way." The Politics Show wants to hear from you. Simply fill out the comment form below. Join Sophie Long and Chris Rogers for The Politics Show every Sunday at One o'clock on BBC One.